When Apollo was blazing its pioneering trail to the Moon, the nascent space industry had yet to set up a comprehensive, worldwide communications network using satellites and ground stations. It would take the efforts of another generation to arrange an infrastructure that would allow crews to at least talk to mission control at any point in their orbit. Apollo crewmen could only talk to Houston for brief intervals of up to seven minutes as they passed over a scattering of ground stations along their orbital path. 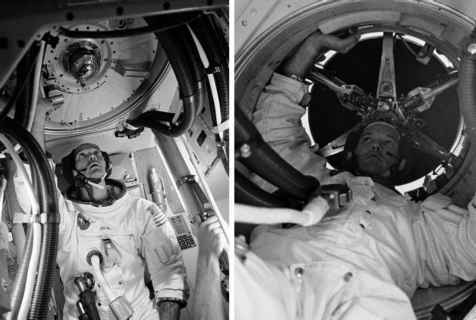 As with many aspects of Apollo, the exact configuration of these stations changed from mission to mission as operational experience was gained and priorities changed. Early missions supplemented their coverage with extra ground sites and a scattering of specially equipped ships filled the gaps between the main sites. Stations were sited on islands or on board ships strung across the Atlantic Ocean away from Cape Canaveral to provide coverage for the Saturn's ascent to orbit. A station on one of the Canary Islands off the west coast of Africa permitted communications on the opposite side of the Atlantic, and another on Madagascar was used during the early missions for coverage as the spacecraft set out over the Indian Ocean. An outpost near Canberra on the east coast of Australia gave coverage on the opposite side of the world. An important station was set up on Hawaii, in the middle of the Pacific Ocean, which covered the first few minutes of the spacecraft's departure for the Moon. This was supplemented with ships and Apollo range instrumentation aircraft (ARIA) which filled in the gaps before a string of stations across the continental United States gave constant coverage to the Atlantic. The ARIA were EC-135 jets - similar in structure to the Boeing 707 jetliner - that were specifically equipped to support Apollo communications. During each short period of communication, data about the state of the crew and spacecraft were exchanged with updates from mission control. Another vital job for some of the ground stations at this time was to track the speed and position of the spacecraft as accurately as possible to refine mission control's knowledge of its trajectory - information that was necessary to ensure an accurate burn towards the Moon. In particular, the station on the Canaries could provide an initial orbital determination and Carnarvon in Australia refined the determination antipodal to insertion.